This Pixar Monsters Inc Sulley Freakshake is my way of bringing Disney’s Pixar Fest to me since I haven’t been able to go! This shake is as tasty as it looks! Plus, I’m sharing more shakes inspired by your favorite Pixar movies. These fun, drool-worthy shakes will blow you away. Freakshakes are basically milkshakes on steroids. Creating one is super easy and a lot of fun when it’s theme-based. Everyone loves them and Disney Pixar movie fans are no exception. 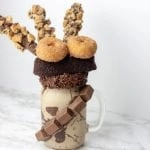 I teamed up with some of my Disney-crazed blogging friends to create drool-worthy Pixar themed freakshakes just for you! These Disney Pixar freakshakes are all inspired by some of our favorite Pixar movies. 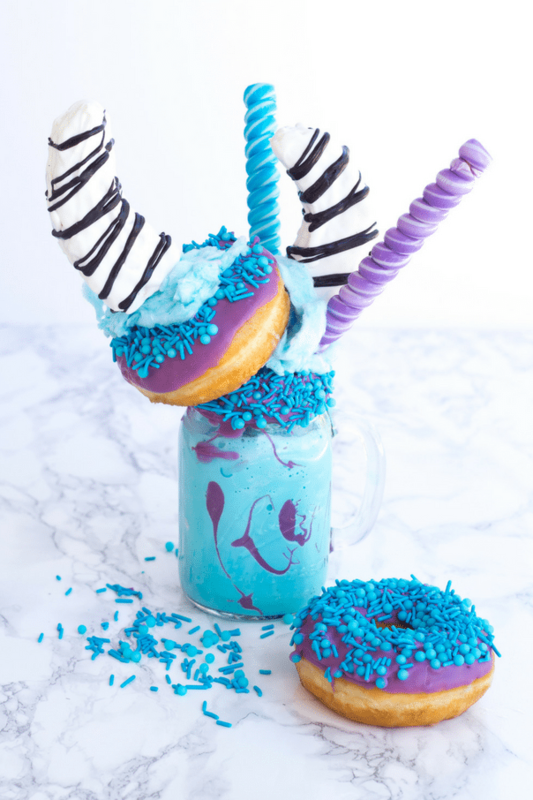 It’s hard to have only one favorite Pixar movie, but Monsters Inc. is high on my list, that’s why I created this Monsters Inc Sulley freakshake. I love how even though Sulley appears to be mean and scary, Boo melts his heart and changes how he feels about scaring humans. Sulley’s Horns – I used a king size premade crispy treat. Simply cut it in half and use your hands to shape each half into a pointed horn. Insert a treat stick into the bottom of each horn. Then, melt some white candy melts in a shallow bowl and dip your horns to coat. I dipped one side and let dry on waxed paper before dipping the other side and coating edges. 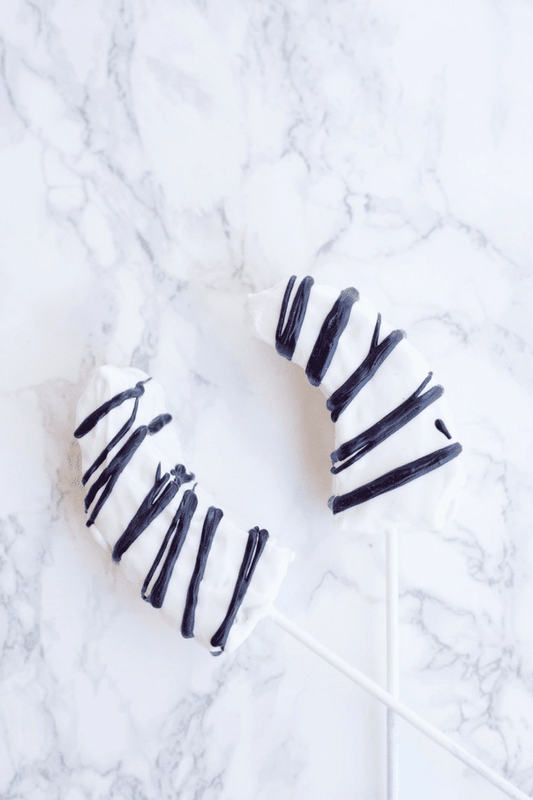 Next, melt black candy melts in a resealable sandwich bag. 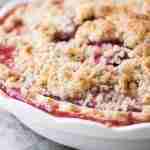 Snip the corner of the bag and drizzle over horns in a zig-zag pattern. Set aside to harden. 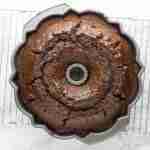 Donut – Take a premade glazed donut and dip into a shallow dish of melted lavender candy melts. 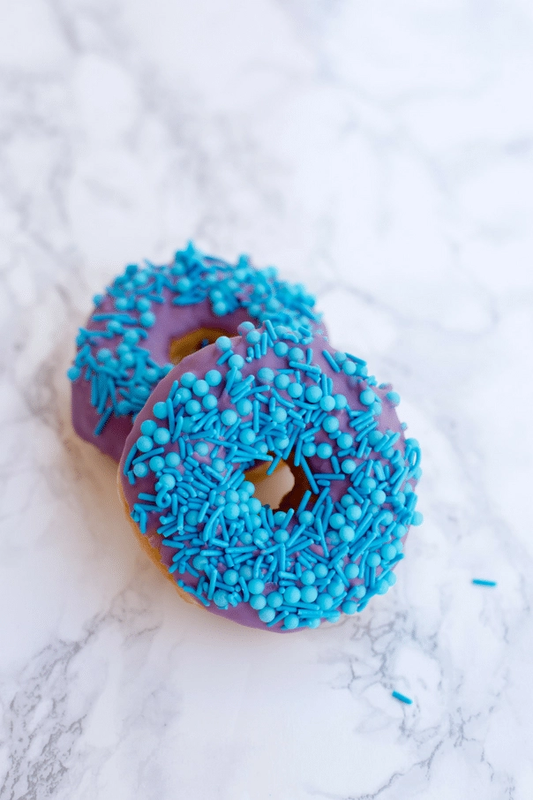 Immediately dip the donut into a dish of blue jimmies and blue jumbo nonpareils. Set aside to harden. Prepping Your Glass – Using a spoon, put some of the lavender candy melts inside of your glass. 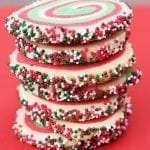 Next, roll the rim of your glass and immediately dip in the bowl of sprinkles. Set aside to harden. Make the Shake – Blend 1/2 cup of milk, 5 scoops of vanilla ice cream, and several drops of sky blue icing gel. 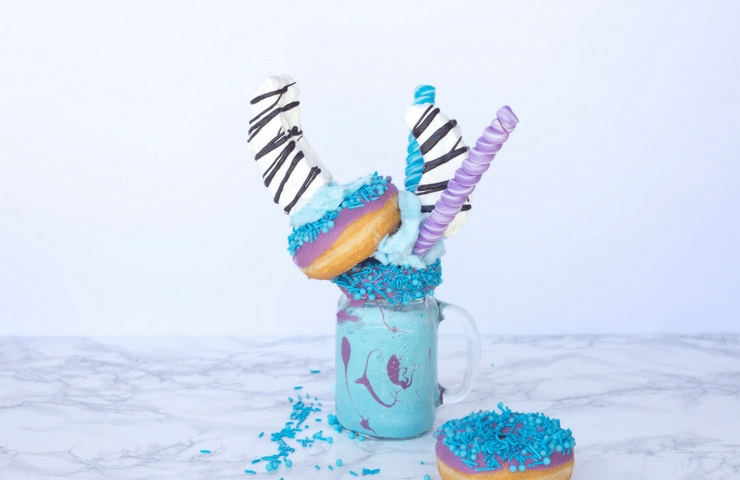 Putting it Together – Pour shake into glass and top with the donut, horns, and purple & blue lollipops, and blue cotton candy. 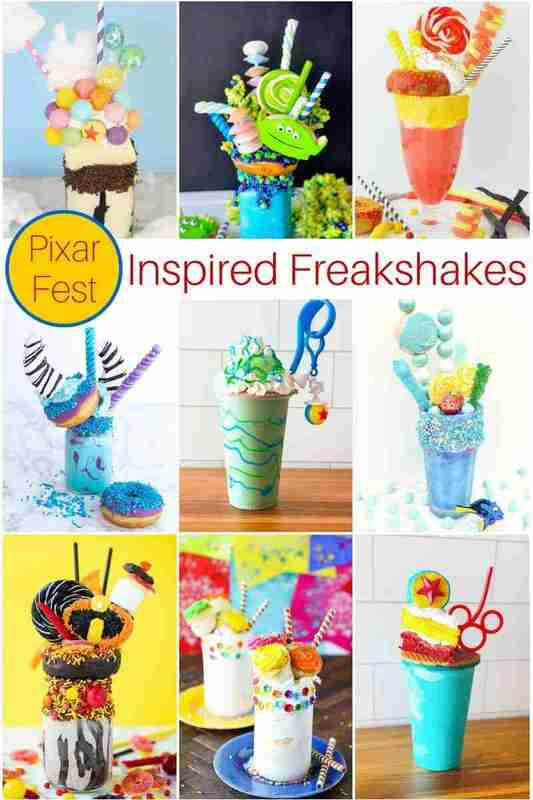 Some of my Disney loving friends are sharing some awesome Pixar Fest inspired freakshakes too. Check out how fun they all turned out! What’s your favorite Disney Pixar movie/character? This Monsters Inc Sulley Freakshake is as tasty as it looks! Plus, I'm sharing more shakes inspired by your favorite Pixar movies. These fun, drool-worthy shakes will blow you away. Are you dreaming of your next Disney vacation? Yours is my favorite! Adorable simply adorable!